Quite leisurely from the disaster . . . .
Icarus, son of Daedalus, has inspired many artists, including painter Pieter Brueghel and poet W. H. Auden. These artists expect their audiences to be familiar with the legend of Icarus and to understand the works of art in the context of the myth. 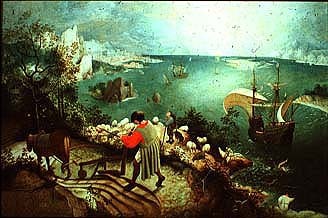 Because Auden's poem contains allusions--brief references--not only to the Icarus story but also to Breughel's painting among other works and events from the past, Musee des Beaux Arts is an especially rich poem for illustrating the concept of allusion.